Orbbec Astra provides full body tracking. 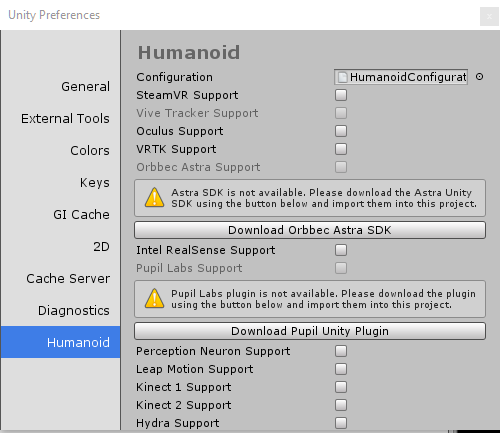 Orbbec Astra is supported in Humanoid Control Plus and Pro version 2.0 and higher. Orbbec Astra, Astra S and Astra Pro are supported. Orbbec Astra is only supported on Microsoft Window 10. Unity v5.5 or higher is required. 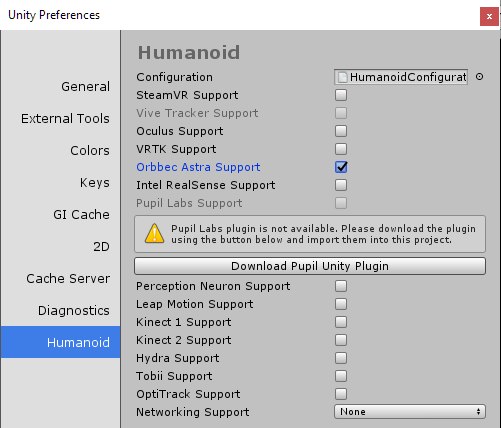 For the Orbbec Astra to work, the Astra SDK Package for Unity needs to be imported into the project. Click the button Download Orbbec Astra SDK to go to the download page for the Astra SDK. After the SDK has been imported, the Orbbec Astra Support can be enabled in the preferences. Disabling Orbbec Astra Support ensures that no code related to the Orbbec Astra is included in the build. To enable Orbbec Astra tracking for an avatar, Orbbec Astra needs to be enabled in the Humanoid Control component. The Orbbec Astra (Transform) is a reference to the Transform in the scene representing the Astra sensor. This GameObject is found as a child of the Real World GameObject and is only visible in the scene when Humanoid Control->Settings->Show Real Objects has been enabled. The Orbbec Astra (Transform) can be used to change the position of the tracking relative to the player in the scene. When the Astra is used in combination with a VR headset, the position of the Orbbec Astra Transform is determined automatically.